La Storia is not on the fashionable Central Avenue like most of West Bridgford’s other restaurants. Instead it’s behind Trent Bridge on the residential Musters Road. It does make it easier to find a parking space though so I was happy enough. The restaurant has been open a couple of months and was suitably shiny and new inside. I liked the décor, open and bright but retaining a homeliness. The menu follows a traditional Italian style of antipasti, primi, secondi and dolce. In my basic translation that is; starter, pasta, main, dessert. You can get one of each of these for £28, a potential saving of over £10. Whilst that sounds appealing I think most people will struggle to manage that much food, we opted to skip the pasta. Bread and olives often seems a good place to start, along with a glass of wine from an interesting and reasonably priced list. These weren’t cheap at £3.50 and £3 respectively. The bread tasted as though it had been sitting around for a while and the oil (particularly the balsamic) was low quality. Olives were nice but we did have to mention they hadn’t arrived after quite a while. Having had a sneaky look at the menu a couple of days before I had my eye on clams in a tomato sauce. Sadly, I was told that they didn’t have any but mussels were available instead. Honestly, everything would have been forgiven with a knockout sauce. I was looking forward to the punch of garlic and a deep red of tomato from an Italian concoction like this. 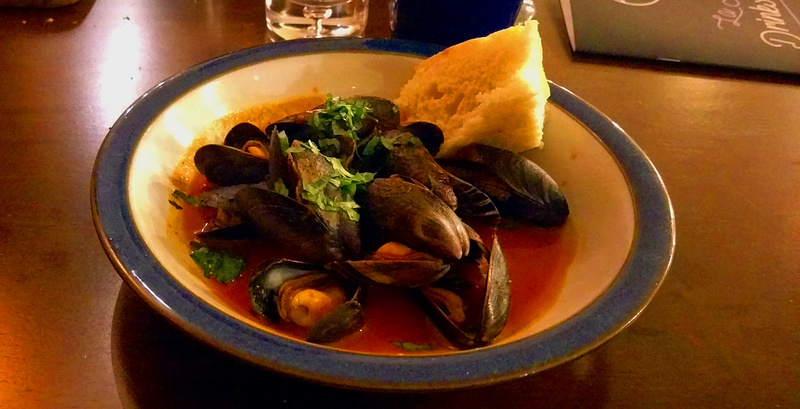 Whilst it wasn’t bad, it didn’t really stand up to the mussels and there wasn’t enough of it. Perhaps it would have worked better with the sweeter more subtle clams. Main courses were rustically presented, the new menu is very much in season so hearty is to be expected. I went for a homemade sausage with chickpea and lentil casserole to combat the cold nights. There were a couple of issues, the sausage itself was dry and dense and a fennel seed was somehow the prevailing flavour. The casserole element was also dry, very little liquid along with the chickpeas and lentils. Combine that with a few quite good roast potatoes and a disappointingly small clump of spinach and you’re left with a dinner that’s hard work to get through. Even with some freshness or a sauce the sausage itself would have been underwhelming. Dessert was a redeeming feature at least. I did miss seeing the usual names in the choices, no panna cotta, tiramisu or affogato here. The chocolate cake was recommended and did turn out to be the highlight of the meal. Its pastry was well cooked, not too think and the chocolate a good flavour despite not looking very dark. I wasn’t quite sure how Italian it was, a token additional dollop of amaretto sauce didn’t really bring anything to the dish. Ooo thanks for the recommendation, will have to try and check it out! I’ve only been to Jamie’s once and was v.disappointed. I feel like I should go back to check it wasn’t a one off! Shame this didn’t score well, I can’t recall another Italian in WB? Hi, thank you for taking the time to leave us a review, we appreciate any comments that come our way. As the owner, I would just like to point out that on the night of your meal (18/1/17), we had just launched a new menu, hence why every table had feedback sheets to leave us comments and any feedback in order for us to improve; or just to get a good idea of customer reaction. Overall the feedback was great, however, i do feel that there were areas to work on; in particular the homemade sausage dish. It is now a new and improved version. We took the time to read over 70 feedback sheets left by customers and maybe you could have expressed your thoughts on the feedback sheets? or to myself on the night as well as writing your blog… i would had really appreciated that… but never mind. If you ever do decide to come back then i hope your views of us change as we do have a strong passion in what we do… the same as i am sure you have in your blogging. Possibly a case of bad timing, it was a few months after you opened and I hadn’t appreciated you were launching a new menu. Equally I would love to have the time and money to visit places on multiple occasions and try more dishes to get an even better view of a restaurants capabilities and consistency. Not surprised by your comments. I was disappointed by them also. They took a booking for my birthday and produced some really uninspiring fare on an evening when they were sadly understaffed. The owner also has a propensity to unfortunate ripostes when informed of shortcomings. A shame, I initially had high hopes of this place.